As usual, the above examples are just a miniscule set of the many collectibles available on the bourse. Our dealers provide a wide range of coins, currency, bullion and other collectibles each month. Since many of the dealers attend other shows, they bring different specimens for display from one month to the next. Visit the next Greater Atlanta Coin Show on Sunday, April 7, 2019 in the Joe Mack Wilson ballroom to buy, sell, trade or just browse among the treasures on display in the dealers' showcases. Many visitors came to the March 2019 Greater Atlanta Coin Show with its bourse filled with dealers and their showcases displaying coins, currency, bullion and other collectibles. Thank you to all of the people who made the coin show a busy and fun place to spend a few hours - the many visitors, the dealers, our security and the hotel's staff. The show welcomed old friends who visit frequently along with many new guests to the show as well. Thank you all for joining us. This month, the weather provided a light rain in the early morning changing to sunshine by mid afternoon. In other words, it was a great day to be out visiting a coin show. As usual, the hotel had church groups in some of their meeting spaces, otherwise the space was not as busy as last month. As for coins and collectibles, some people came to browse and buy, others came with items to sell, while some came to obtain appraisals. The buyers searched for rare currency, Walking Liberty half dollars and BU (Brilliant Uncirculated) Franklin halves. In particular, the show enjoyed some young numismatists working diligently on their collections. One, a repeat guest, continued to search for just the right additions to her Indian Head Cent collection. Some sellers brought silver bars and 90% silver coins while others had collections such as proof sets to offer the dealers. Dealers at the show offer free verbal appraisals for collections, and people brought items from their grandparents to find their current value. Now, let's take a virtual look at just a few of the items found on the bourse. Okay, this is not really a collectible, however the show enjoys allowing a few Boy Scouts to sell their camp cards each year. 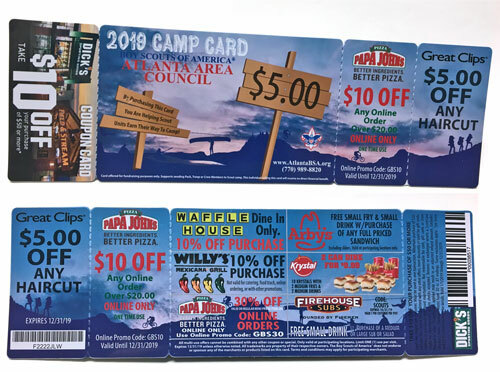 "Camp Cards are designed to help units and their members earn their way to summer resident camp, high adventure base or day camp. Units participating in this program will earn 50% commission ($2.50) for each $5 Camp Card they sell. The sale begins the first week of March, giving units over two months to sell. "Companies have offered generous one-time and multiple use discounts that makes the sale of this card a no-brainer. Customers using just one tab, recovers the purchase price of the card! There is well over $250 worth of savings on each card. "What is the reason? ... planning an Eagle Scout Leadership project, earning their first merit badge, white-water rafting, experiencing their first campout, etc. For those of you that purchased the Camp Cards, thank you for helping them grow with scouting. This collectible, a shoulder patch, comes from the military. 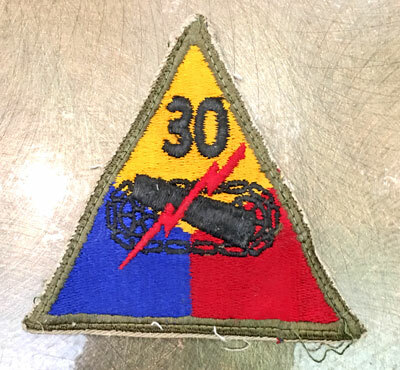 "In 1954 the 30th Infantry Division was reorganized, with units in North Carolina and South Carolina constituting the 30th Infantry Division, and units in Tennessee forming the nucleus of the new 30th Armored Division. "Though never federalized during wartime, the 30th Armored Division (called 'Volunteers,' for Tennessee's 'Volunteer State' nickname) was activated for support to law enforcement, including responses to civil disturbances in Memphis and Nashville after the assassination of Martin Luther King, Jr. The next collectible comes from the automotive industry, in particular, for the Corvette enthusiasts. Through the years, several different, yet related, emblems have graced the sports car. In the beginning, the emblem contained an American flag crossed with a checkered flag, however at that time it was illegal to use the American flag as part of a commercial design. Instead, they introduced an emblem with the checkered flag crossed with a red flag containing the Chevrolet bowtie and a fleur-de-lis design. Some years the flags would be encased in a circle and others the flags stood alone. Also, the angle of the cross changed through the years, sometime broad, others more narrow. In later years, the flags became more stylized with a "V" in the middle rather than an "X." You can find one writer's view of the emblems through the years in Part I and Part II with associated images. Based on their research, Chevrolet introduced this particular emblem in 1977. Of course, true Corvette aficionados can probably provide the specific model, engine, etc. The next collectible highlights an excellent example of doubled die in the obverse of the 1955 Lincoln Cent. 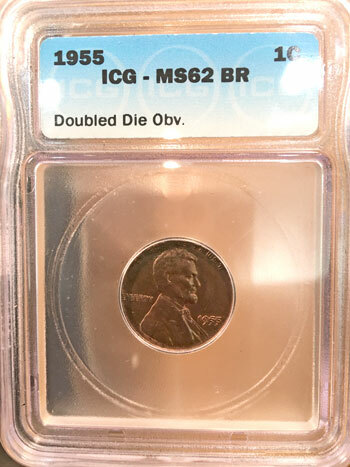 "Jaime Hernandez: The 1955 Doubled Die Lincoln cent is unquestionably the most famous doubled die coin in the entire Lincoln cent series and possibly, even the most famous doubled die coin in numismatics. "The 1955 Doubled Dies were created when the Mint struck a working hub and a working die together while they were both slightly rotated differently from one another. Consequently, this working die then received a doubled die impression and in return, it struck thousands of 1955 Doubled Die cents. "After the 1955 Doubled Dies were produced they were then mixed with millions of regular circulation strike cents from that same year. However, Mint employees caught some of the 1955 Doubled Die cents before they went into circulation. The Mint then decided that it was just not worth the trouble of melting millions of cents to retrieve the approximately 20,000 Doubled Die cents that were accidentally produced. "In the following months 1955 Doubled Die cents were finally turning up in circulation, including in cigarette packs which were being sold in vending machines. At that time, a pack of cigarettes would cost 23 cents each but the vending machines would only take a quarter and no other change. Therefore, the cigarette companies would need to place two cents inside each pack of cigarettes to be given back as change. Anyone who inserted a quarter in the vending machine would then receive a pack of cigarettes with two Lincoln cents inside a cellophane packaging. This cellophane packaging was then wrapped around the cigarette packs with the two Lincoln cents inside it, and this is where many of the 1955 Doubled Dies surfaced. 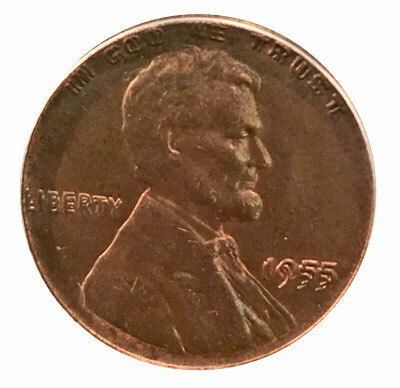 "In conclusion, due to the high prices that the 1955 Doubled Die Lincoln cents command, there are many deceiving counterfeit coins out there in the market. One of the main diagnostics of a genuine 1955 Doubled Die cent can be seen on the reverse of the coin. Since there was only one pair of dies used to create the 1955 Doubled Dies, all genuine examples should display vertical die polishing lines to the left of the letter T in ONE CENT. Authentication is strongly recommended for this variety." For some double-die errors, one needs a loupe to find the doubling. Not with this example. Just look at the doubling in the letters and the date. "Since 1955 Doubled Dies were being found the same year in which they were released, many coins were pulled aside and preserved. Because of this, most coins exist in AU grades and higher. The original estimate of existing 1955 Doubled Die cents was anywhere from 20,000 to 24,000 coins. Nonetheless, many coins possibly got lost in circulation and the amount of surviving examples may be more like 10,000 to 15,000 examples in existence in all grades combined. 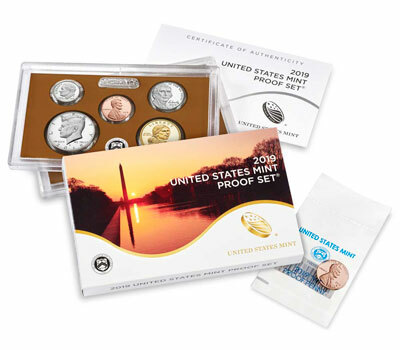 "The 2019 United States Mint Proof Set features 10 proof coins encased in two clear plastic lenses in a beautifully designed package you’ll be proud to display. One of the Mint’s signature products, it is a great addition to any collection or the perfect gift for a special occasion. With sharp relief and mirror-like backgrounds, U.S. Mint proof coins have frosted, sculpted foregrounds, giving them a special cameo effect. Next on the collectibles list is the US Mint's new proof set for 2019. 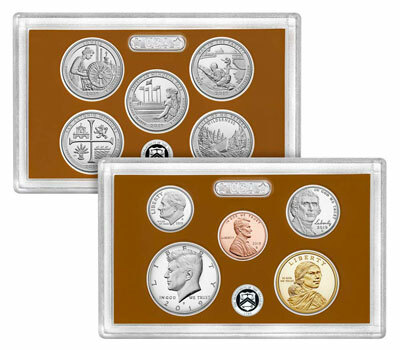 This set contains the normally available ten coins, but it also has a special Lincoln Cent. "New this year! 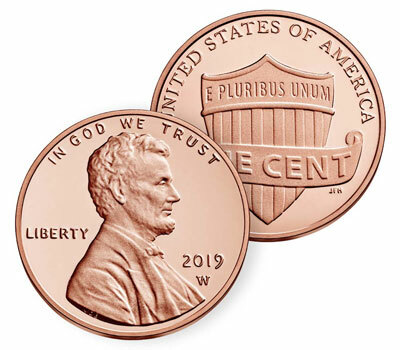 Premium Coin: The 2019 proof set is accompanied by an additional, special edition 2019 Lincoln penny with a proof finish struck at the West Point Mint with a “W” mint mark. This special coin is packaged separately in clear United States Mint plastic wrap. "This is the first of three sets to include an additional special edition penny with a “W” mint mark in 2019. The United States Mint Silver Proof Set® will include an additional special edition penny with a reverse proof finish and the United States Mint Uncirculated Coin Set® will include an additional special edition penny with an uncirculated finish. Learn more about the special edition Lincoln Penny collection. "The 2019 United States Mint Proof Set is a must-have for any coin collection. The images of the proof set on the bourse had too much glare. These images are courtesy of the US Mint. "In 1968 the headquarters of the Mississippi Army National Guard's 108th Armored Cavalry Regiment was reorganized as 1st Brigade, 30th Armored Division. (The brigade was subsequently designated the 155th Separate Armored Brigade.) In addition, in 1968 units from the Florida Army National Guard and Alabama Army National Guard also became part of the 30th Armored Division. "The 30th Armored Division was inactivated in December, 1973." Due to the large market for military patches, there are reproduction collector patches in addition to the original military-issued patches. There is an excellent discussion of original versus reproduction patches on the US Militaria Forum. This patch certainly appears original with the shirt material as a background.